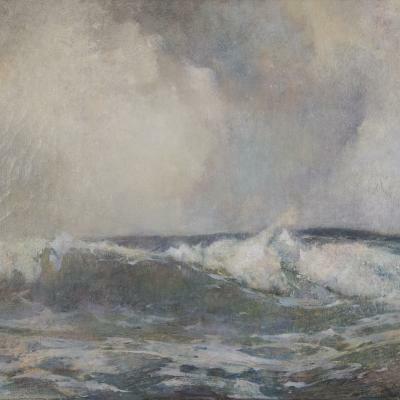 Regarded today as one of the more prominent artists of the late 19th Century, Emil Carlsen spent many years as a penniless painter on the fringes of the art world, while he continued developing his still-life painting techniques that would take the rest of the art world several decades to fully appreciate. Some historians have described Carlsen as having a rather uneventful life, and while there may be an absence of the kind of unpredictability and turbulence that make for interesting biographies, Carlsen's life seems, in retrospect, anything but dull. There was something of a bohemian streak in his personality, living in a remarkable number of places during the first many decades of his career. Born Soren Emil Carlsen in Copenhagen around 1853, Carlsen first began his studies at the Royal Danish Academy as a teenager. Yet he was not to remain long there, leaving in 1872, at nineteen years old for America where he settled in Chicago, working for an illustration house to support himself. By 1875 he had saved enough money to travel to both Paris and Copenhagen to paint and study, staying for six months before returning to America, this time to New York. By this time he had already developed a unique love affair with the still life. 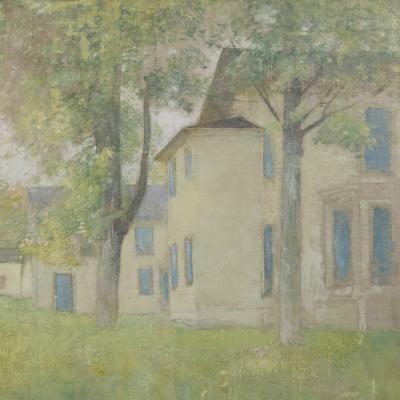 In New York he befriended fellow painters such as John Francis Murphy; yet the city could not contain him, and after only a year he relocated to Boston, where he developed a life-long friendship with Childe Hassam. Carlsen remained quite poor throughout his time in Boston where he spent the next eight years. Yet his abilities were developing quite rapidly in still life painting, in a style which scholars refer to as "kitchen still lifes." These were still life scenes that often included fish or birds along with pots and pans which gave an implied presence of the cook outside the frame, giving them a more human element than most still life subjects. This style very much echoed the work of the Dutch and Spanish Masters of still life, particularly that of Jean Simeon Chardin and, to a lesser degree, Johannes Vermeer. The similarity is not coincidental, as Carlsen spoke and wrote often of the influence of these artists on his own work, and yet he was already beginning to develop the eye for color, light and composition that today we regard as the undeniable Carlsen style. In 1884 Carlsen moved again to Paris, staying for two years. Here, as always he kept a low profile, preferring the mediation of working in the studio to the more social and recreational gathering places of artists and expatriates. In 1887 Carlsen moved to San Francisco, working for the directorship of the San Francisco Art Association School, and in 1891 moved back to New York where he lived until 1901. It is during this period, in the last decade of the nineteenth century that could be regarded as the most formative in terms of the development of the techniques that produced the paintings for which he is most celebrated today. Though still life had been an established genre throughout the century, it was not the easiest genre with which an artist could earn a place in salons and was less reliable as a salable work of art. Often encouraged by other artists and would-be patrons to switch over to landscapes and marines to make better money, Carlsen resisted this venue for many years, remaining stubbornly in his pursuit of the still life. And when one looks at examples of Carlsen's work in this crucial transitory phase, one can tell that he felt himself truly on the verge of something wonderful. Many other artists perhaps felt the still life genre to have exhausted itself; that it offered few possibilities for new ground, and that it was certainly not a genre on which one bases the core of their work. Yet as Carlsen began to move away from the traditional arrangements and elements of still lifes, he became increasingly fascinated by textures like the copper, bronze, brass and silver of pots and bowls and the shadows that their curves and lines produced against shaded backdrops. While the Dutch still life painters had already developed the moody tones of dark pockets and shadows, Carlsen brought out a great range of the emotions that accompany that moodiness. As he progressed, Carlsen managed to de-contextualize the objects in his paintings, until they were no longer just brass and copper pots or the pure effects of the colors they radiated, but something in between; where it was no longer the actual use or purpose of an object that mattered in relation to other objects around them or the arbitrariness of their arrangement together, but the very singular existence of the objects themselves, separated from the people and the ordinary use they would have for it, as well as the ordinary light in which they would usually be seen. The dimness of the light only added to the mystery. And yet Carlsen's fascination with surfaces made him often instill his shadows with great textures that played with and complemented the qualities of the objects that seem to glow from the canvas. The effect is that even the 'somber' darkness of the shadows seems to radiate light and color. It was not until the 1910's and 20's that Carlsen began to benefit financially from his painting, even though he'd already had the respect of his fellow artists all along. Despite his long career and his wide travels, he left few written accounts of his travels, and thus there are many in his biography that historians have tried to reconstruct. His habit of dating some pictures and leaving others blank has also made it difficult to reconstruct the exact progression of his technique from picture to picture. He often abandoned certain traits only to pick them up again before finally discarding them as he honed his style and his eye. The result is evidence of an artistic meditation that progressed with consistency and caution. Carlsen's death in 1932 was at the height of his popularity, and he left behind an admirable body of work in which he had redefined the cerebral and metaphysical effects a still life can have on a viewer. Then he broke the mold. Surviving him was his son Dines who had already become very successful in his own right, developing even further the unique techniques of color, light and texture in still life from his father. 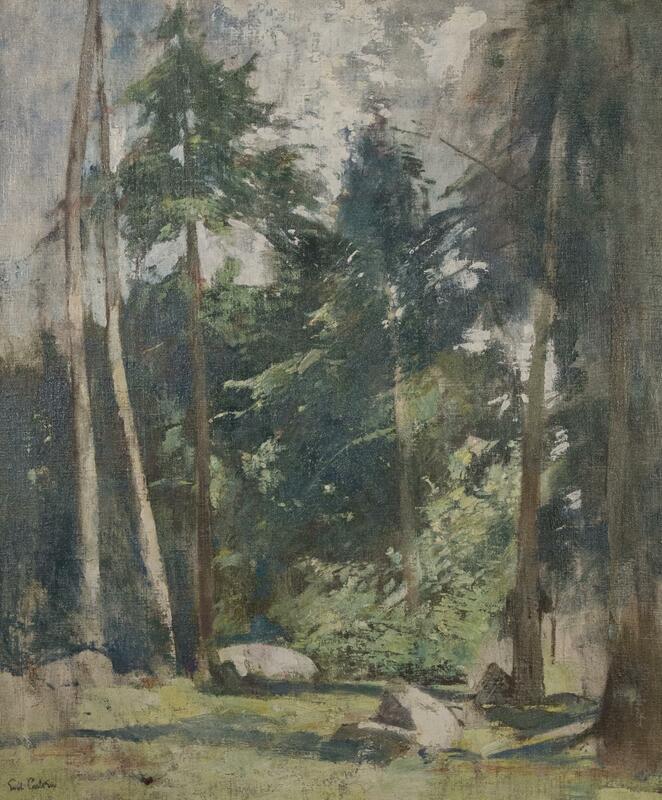 Forest Clearing was one of Carlsen’s final compositions, completed only about a year before his death. 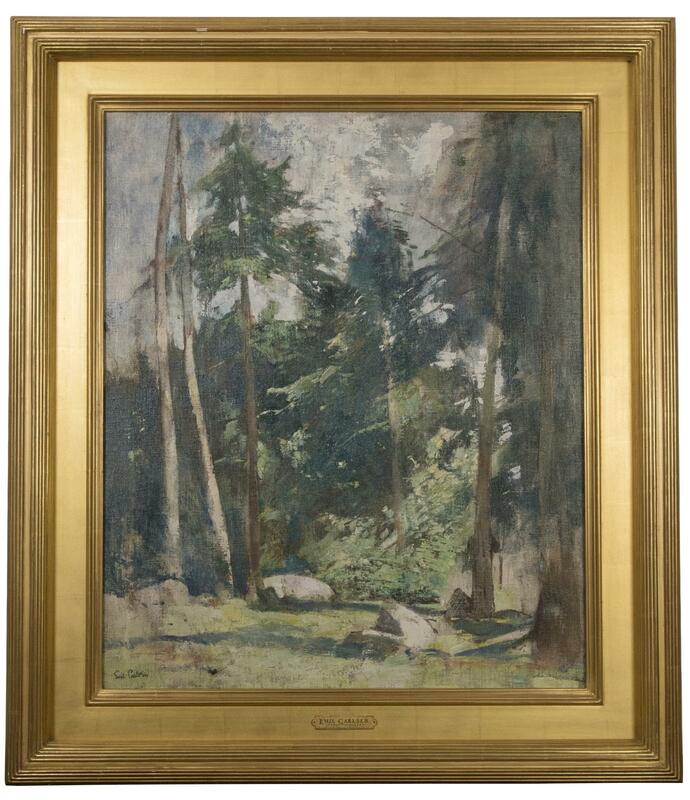 It is one of only two fully-realized landscapes in oil that the Emil Carlsen Archives have dated to circa 1931, both pictures being meditative, placid woodland scenes. Regarded today as one of the more prominent artists of the late 19th Century, Soren Emil Carlsen stands outside the major mainstream artistic trends of his day. 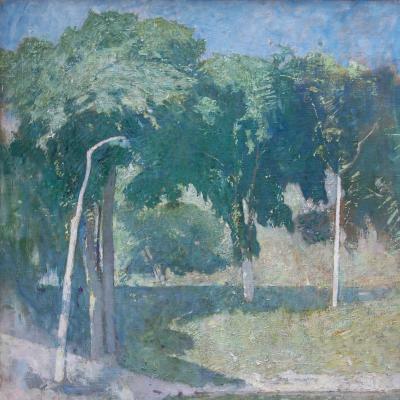 He is remembered as an artist who single mindedly followed his own particular style of painting, creating a unique beauty and aesthetic in his paintings such as Forest Clearing. In this landscape Carlsen reveals his particular interest in light and its attendant reflection about a green glade peppered with rocks. There is an overriding feeling of calm achieved through a composition that is balanced and a color palette that has been softly graded. In such landscapes Carlsen attempted to transform the elements of nature into a harmonious blending of color and form that results a poetry of soft music. Lyricism is Carlsen’s most outstanding attribute. Carlsen is not so much a painter here of trees and sky, but rather a painter of the moods of nature. There is no drama or deep emotion in this landscape. Instead there is a calm composure and a harmonic orchestration of elements. The beauty of nature here is static and peaceful, a notable achievement for this artist.